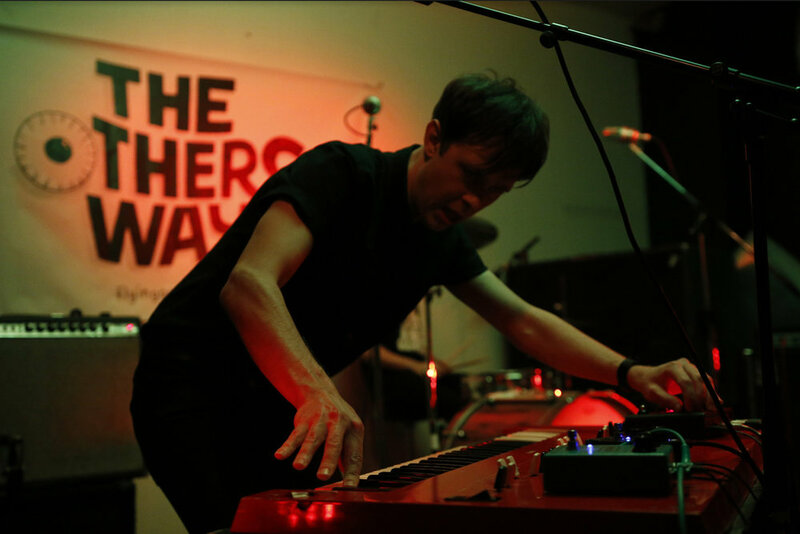 The Others Way is a music showcase or festival that started four years ago, in Auckland, New Zealand. This is a personal account of the story so far. In 2015 I had just moved on from St Jerome’s Laneway Festival Auckland. I loved that event and was proud of it, so was sad to leave. But, Laneway had grown into a year-round behemoth of a project. It was a lot of work, and I was committed to too many different things. I realised what I enjoyed most was releasing albums and working with local New Zealand artists, ones I knew personally. With touring international acts, you don’t really get to know them. They’re there for a day or two, then they’re gone. Other projects I was involved with seemed to be going well. Flying Nun Records was expanding into the US and Europe. We were releasing good albums by new artists, and reissuing some essential albums. The recently launched online store Matthew Davis and I had established, called Flying Out Music, was successful. So I decided to focus my energies into these areas. In April 2015 Flying Out had opened our physical record store on Pitt Street, just off Karangahape Rd, in Auckland (New Zealand). We sold vinyl produced by Flying Nun, Arch Hill and other titles we liked. Also T-shirts, merchandise and similar items. Flying Out inhabited a three-story building, previously a shaver shop since the early 1980s. There was a basement we could use for events and a warehouse for distribution, a shop on the middle floor and offices upstairs. Although people were talking about a vinyl comeback, opening a store was a risky venture. It was against the grain of gloom that pervaded the music industry. So we realised we needed to be a bit different. From what I could see internationally, the music stores that did well were based around a sense of community. People were looking for a place to talk about and experience music, preferably with other people. If we wanted Flying Out to be successful, this seemed like a reasonable course of action. We started putting on some minimal events in our basement. Hamish Kilgour, Tiny Ruins, Peter Jefferies and many others. Zac Arnold curated a series of club nights at The Wine Cellar - called The Others Way (named after a DoubleHappys song). We encouraged people out on a Thursday night with free Pizza. Zac organised a series of excellent shows with artists ranging from Nadia Reid to She’s So Rad. However, because we had a new record shop, Matthew and myself felt we needed to make a bit more of a splash. To do something bigger. To get something exciting happening in the neighbourhood. The last thing I thought I’d become involved with was another music festival. But we had heard the US band Beach Fossils were looking for an NZ tour in early September. They were on the label Captured Tracks - who we work within the US. We had done a tour with the Canadian band The Courtneys the year before which had gone well, so why not do another tour and expand it into a small event with several venues? We wondered if it should be a Flying Nun event, so we asked The Bats to play and Garageland to reform. Soon Fazerdaze, Tiny Ruins and Aldous Harding were on board. Next thing we had a whole lineup, not just of Flying Nun artists. In the meantime, Beach Fossils dropped out. But it didn’t matter. We were going to put on a one time only big night out. We would book all our favourite bands - Flying Nun or otherwise. The Others Way also coincided with the Going Global Music Summit. This is an event that bought out international people from the music industry to New Zealand. It seemed like a good chance for these people to get exposed to some more great local music. It was a hectic few months in the lead-up - logistics, working out the schedule, the lineup and all the complicated factors that go into a multi-venue event. Although I had put on plenty of live shows before, and been a partner at Laneway Festival NZ, a multi-venue event like The Others Way was a bit different. Capacities can be an issue - which venues will be too full? Which bands will people be annoyed at clashing? 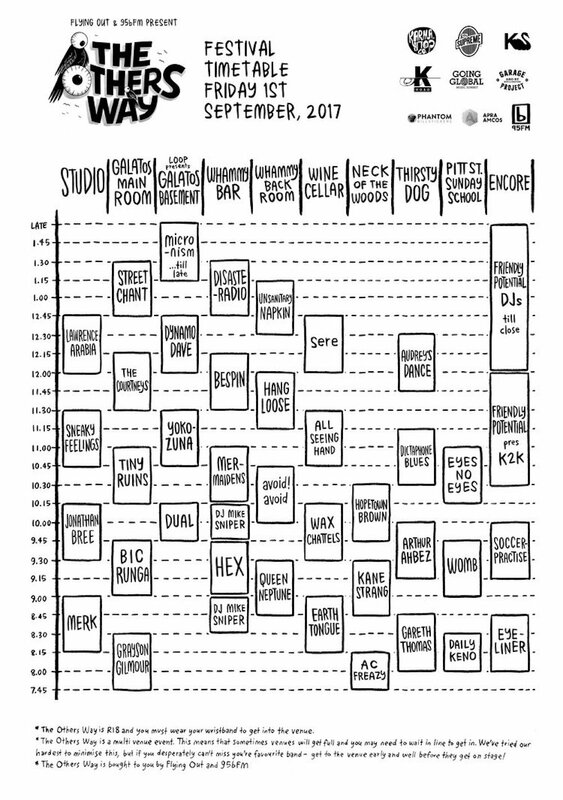 How do you avoid a scenario like SXSW where it is almost impossible to get into any venue? (even after paying $1000 for a VIP pass). As it happened, the first Others Way sold out and went off without a hitch. One of the most rewarding things was that the audience was so up for discovering new music. Everyone had a different new or favourite act they were excited to see. Often it would be something entirely unexpected or niche. It wasn’t just the major acts. The Others Way was an event very much for music fans. Although we never planned to start a music festival, we did it again. And twice more. Now we are in our fourth year. The Others Way is a kind of accidental music festival. Here are some of my highlights and memories from the first three years. The first Others Way: seven venues and thirty-one acts performing. I recall the night kicking off in the Flying Out basement with October in what may have been her first Auckland show. It was good, but I didn’t stay long as I wanted to catch Kane Strang who was playing at Galatos. At that point, Flying Nun had released his debut album and some months before this show he had signed to US label Dead Oceans for the next album. Phil from the Secretly Group (of which Dead Oceans is a sub-label, and Flying Nun is distributed in the US by) was in town for Going Global and this was the first time he had seen Kane play. When I got to the Studio at 8.30pm for Aldous Harding, the room was already full. Despite this, while she played, it was so quiet you could have heard a pin drop. The audience was utterly transfixed. Hannah was quite nervous but sounded incredible. It reminded me of an early Cat Power moment. Marlon Williams came out on stage and sung a few songs with her. At this point, we had sold a lot of her debut album, but I felt most people - certainly the NZ music industry - didn’t realise how popular she was becoming. In the audience was Meredith from the great US booking agency Panache, who was keen to work with Hannah right then and there. Meredith went on to book a Deerhunter tour for Aldous in the US, which was one of the things that resulted in Aldous’ 4AD signing. This felt like a significant show for Aldous Harding, both in what happened next, but also it switched a lot of New Zealanders onto her music. From there I was pretty much on the run from 9pm-10.30pm. Street Chant, Zen Mantra, Tiny Ruins, Ghost Wave, Princess Chelsea and avoid!avoid. This segment is a bit of a blur, but I recall all were excellent. That night, Fazerdaze also had an outstanding show. Playing in Whammy Bar, there were lines outside to get in, and Amelia was genuinely surprised at the interest. She had only released her EP at this point. Off the back of this performance, at least three or four international record labels were wanting to sign Fazerdaze. Thankfully for us, she decided to sign with Flying Nun. The final run of the night was The Bats, Garageland and Silicon - the last being an almost otherworldly experience. By that time late in the night things start to get a bit surreal. The second Others Way: ten venues and forty-four acts performing. The second-year kicked off with a talk in Samoa House, where Russell Brown interviewed Roger Shepherd about his new book. Samoa House was a great venue (unfortunately we couldn’t get it in 2017), the deep grooves of Carnivorous Plant Society and Scuba Diva being particularly well suited to the high wooden Fale style building. We called this room the Freak Funk Fale. Other memorable moments were the feel-good anthems of Voom kicking the night off at the Studio, and Mermaidens, Fazerdaze and Cut Off Your Hands in Galatos. The latter tore the roof off and established the tradition of closing out that venue with a party vibe. Over in the Studio, David Kilgour was loud, and searing - sound man Tex Houston showed me on the mixing desk faders - David’s amp was so loud on stage he didn’t even have it running through the PA. Grayson Gilmour, The Beths and Phoenix Foundation were also memorable. In the ‘Room of Doom’, over in Neck of the Woods, both Shocking Pinks and King Loser were gnarly - I recall climbing onto a chair or speaker and watching Chris Heazlewood unleashing evil guitar onto the sweaty crowd. Continuing with a feel-good anthem vibe to start proceedings, Merk kicked things off excellently in the Studio. In the same venue, Jonathan Bree followed with an eleven-piece band, sporting spooky white fabric mummy masks and an intricate array of unusual and different instruments. Earlier Bic Runga played Galatos - it was great to see her. My concerns about the venue being overfull and people not being able to get in did not eventuate. The Whammy-Wine Cellar subterranean vibe is always something a bit special. Down in the catacombs avoid!avoid were crushing - in a good way - with Gary Sullivan standing in on drums. Mermaidens played bewitchingly. Over in the big rooms were Sneaky Feelings, Lawrence Arabia, Street Chant and The Courtneys. The latter were feel-good infectious, and it was great to see Lawrence Arabia on a big stage with the full band. One of the highlights of the night were Wax Chattels. I had heard a lot about them. Mike Sniper owner of Captured Tracks - who had come down for the festival and we also had on DJ duties - was down the front. Both him and myself were independently thinking Wax Chattels would be an excellent band to work with - something we only conferred about the next morning. As both Flying Nun and Captured Tracks already work together in the US, it made sense to join forces. We proposed this to the band at a hastily organised lunch the next day. Wax Chattels gained a lot of new fans, both at home and from around the world, that night. This year is the biggest yet - both in the number of venues and acts. There are fourteen venues and around 50 acts performing. It is also the first year I will also be playing myself, with my old band Superette. Hopefully, we can remember the songs. It is no secret that The Others Way isn’t an especially viable event to put on (not many things involving mostly New Zealand music are). However, the reason we keep doing it is that there is a need for something like this - both for local artists and also the community. There aren’t a lot of great opportunities for emerging or new acts to play to larger and more diverse audiences or to be put in front of international industry people, who might then give them an opportunity. For music fans, there is a shortage of curated events where you can discover and try new things - all in the space of one evening. Where else can you can experience such diverse and excellent local music? We try to make it a place to catch up with friends from the music community; to share thoughts and ideas about the music we all care about. The Others Way is this Friday 31st of August, all across K'rd Auckland. It is Sold Out, as has every previous year.